In Breaking van Gogh, James Grundvig investigates the history and authenticity of van Gogh's iconic Wheat Field with Cypresses, currently on display at the Metropolitan Museum of Art in New York. 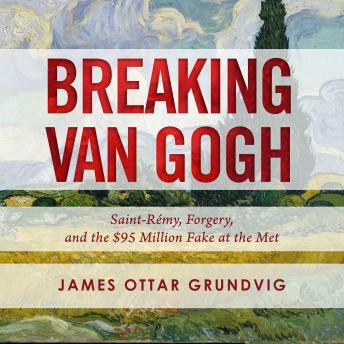 Relying on a vast array of techniques from the study of the painter's biography and personal correspondence to the examination of the painting's style and technical characteristics, Grundvig proves that the "most expensive purchase" housed in the Met is a fake. The Wheat Field with Cypresses is traditionally considered to date to the time of van Gogh's stay in the Saint-Rémy mental asylum, where the artist produced many of his masterpieces. After his suicide, these paintings languished for a decade, until his sister-in-law took them to a family friend for restoration. The restorer had other ideas. In the course of his investigation, Grundvig traces the incredible story of this piece from the artist's brushstrokes in sunlit southern France to a forger's den in Paris, the art collections of a prominent Jewish banking family and a Nazi-sympathizing Swiss arms dealer, and finally the walls of the Met. The riveting narrative weaves its way through the turbulent history of twentieth-century Europe, as the painting's fate is intimately bound with some of its major players.